Vintage 1 Sterling Silver and Glass Oval Salt Cellar. 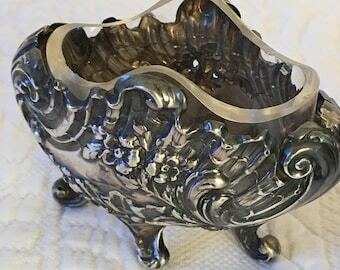 English 1880s to 1910 Sterling SILVER SALT. Beautiful Footed Legs Salt. Choose 1 Handmade Victorian Greeting Card. 1997 Red Satin Fabric, Cotton Heart, Lace 4 Hand Written Greeting. Paper Lace Layers. Choose 1 Handmade Victorian Greeting Card. 1997 Red Satin, Cotton Heart, Lace 4 Hand Written Greeting. Paper Lace Layers in Victorian Style. Curling Iron Teflon Lined Case. Never Wait to Pack a Hot Appliance. Handmade Teflon Lined Decorator Fabric Case for Hot Tools. Announcement Here at Very Victorian we specialize in one-of-a-kind antique and vintage items that we love and we think you will love, too. Handmade items are a specialty and will be offered as they are available. Crafting supplies are always overflowing in our stash so we will be offering them as well. The shop will be ever growing so keep visiting for the new items added. Since we try to keep the prices low for you, we do not give refunds. Here at Very Victorian we specialize in one-of-a-kind antique and vintage items that we love and we think you will love, too. Handmade items are a specialty and will be offered as they are available. Crafting supplies are always overflowing in our stash so we will be offering them as well. The shop will be ever growing so keep visiting for the new items added. Victorian Round Frame With Sepia Picture of a Boy in a Dress With Bow and Buttons. Ornate Openwork Round Frame With Scalloped Floral Design. Vintage Gold Metal Frame With a Picture of Two Men and a Lady. Table Top Stand on Frame With Vintage Picture. Vintage Gold Metal Frame With a 1940s Lady. Table Top Stand on Frame With Vintage Picture. 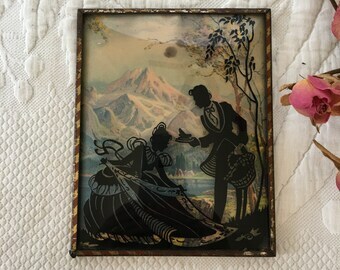 Vintage Reverse Painting on Glass Courting Couple Going on a Picnic. Colored Scene of Mountains and Lake In Background. Vintage Reverse Painting on Glass Courting Couple. "Hearts", No. 2020 Series. Patented May 16, 1933, Deltex Products Co. Brooklyn, NY. 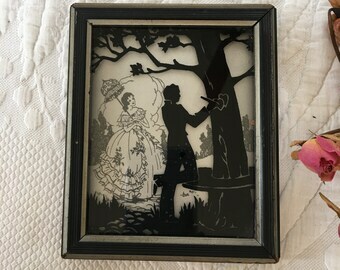 Vintage Reverse Painting on Glass Courting Couple. "At the Gate", No. 2020 Series. Patented May 16, 1933, Deltex Products Co. Brooklyn, NY. Victorian Art Deco Brass Frame With Laurel Wreath and Swags at Top and Colorful Geometric and Swirling Designs on Sides. Scalloped Border. Vintage Wooden Frame With Sailboat Picture Maybe in New York Harbor. Gold Wood Textured Frame. Vintage Rectangular Club 7 Echo Silk Scarf With red Flowers and Tan and Yellow Butterflies on Off White Background and Red Borders. Vintage Peach Chiffon Silk Square Scarf. Light Peach Light Weight Hand Rolled Hem on See-Through Chiffon Scarf. 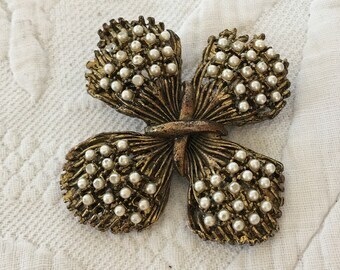 Vintage Seed Pearl Wheat Pin Brooch. Seed Pearls Cover These Stalks of Wheat in a Crossed Design. Feminine. Vintage Wagon Wheel Belt Buckle. Solid Metal With Worn Bronze Finish. Great Country Belt Buckle. Vintage Stick Pin. Gold Swirling Design With Gray Baguette Stone. Slide-on Protective End. Vintage Silver Bronze Jewelry Box or Trinket Box in Long Oval Shape. 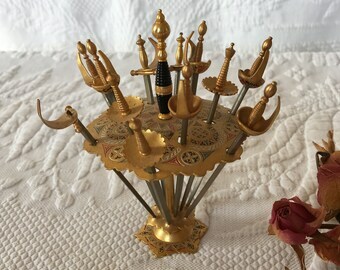 Hinged Lid, Flowers and Birds on Top, Hobnail Edge. Unique Shape. Antique Spool of Covered Wire. Wonderful Old Spool of Cotton Covered Wire. Groove for Attaching the End of the Wire. Vintage Set of 6 Stacking Boxes. Antique Pictures on Front of Boxes. Charming Set of Small Stacking Boxes. Gold Edge on Pictures. Vintage Pettit Point Floral Designs. Vase of Flowers and Bow. Beautiful Design! Gathered Interior Pockets, Ornate Frame and Handle Holders. Vintage Doll Suitcase. Choice of Two Colors, Maroon or Navy Blue. Both Are Trimmed in Brown Vinyl and Gold Latch. Doll Suitcase. Vintage Taktell Piccolo Metronome for Timing Music. Made in Germany. Wittmer Company Metronome. Vintage Punch Stitched Mat. Flowers and Leaves in Coran, Blue, Tan and Black. Geometric Shapes Enhance the Image. Vintage Composite Kneeling and Praying Boy and Girl Figurines. Great for Child's Room or Thanksgiving Centerpiece. Wearing Wool and Cotton. Vintage Pair of Pacific Rim Gold Bow Candle Holders. Metal Gold Romantic Bows That Hold Candles. Great For Christmas Decor. 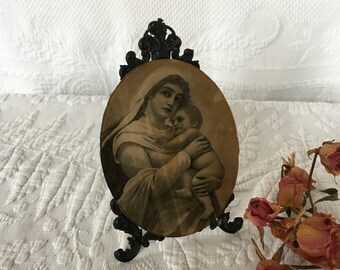 Antique Victorian Madonna and Child on Ornate Black Metal Table Top Stand. Oval Glass With Picture and Wood Oval Backing. Swirling Stand. Vintage Condiment Toledo Sword Picks In Their Own Stand. Cocktail, Appetizer Bar Skewers. Tiny Sword Picks. Decorate Bar or Use for Company. Vintage Blue White Spatter Ware Henn Platter. The Workshops of Gerald E. Henn, Roseville, Ohio. Freezer, Dishwasher, Microwave, Oven Safe. 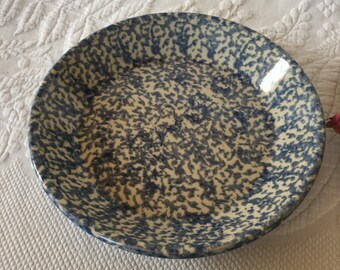 Vintage Blue White Spatter ware Henn Pie Plate. The Workshops of Gerald E. Henn, Roseville, Ohio. Freezer, Dishwasher, Microwave, Oven Safe. Choose Hand Made Fun Fabric Napkins. Colorful Christmas Napkins and One With Frogs on It. Use in Bread Basket or for a Table Mat. Choose Hand Made Wine Bottle Cozie Wrap Carrier. Fabric Presentation Gift Wrap For Wine Bottles. Keeper Bottle Carrier. Hand Made Fun Pillowcase. Colorful Map Pillowcase Great Gift for a Traveling Child or Friend. Pillow Case to Become Attached To. Choose Hand Made Fun Pillowcase. Colorful Pillowcase Great Gifts, Kids or Adults for Special Occasions. Pillow Case to Become Attached To. 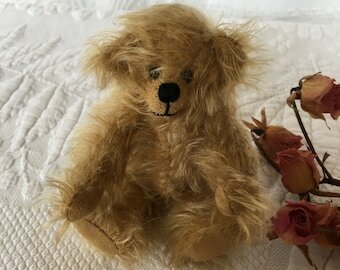 Hand Made Long Mohair Small Teddy Bear. By Barb Celio a Long Time Maker of Hand Stitched Bears. Charming Bear Fully Posable. Cocked Head. Hand Made Long Mohair Small Blue Teddy Bear. Made by Barb Celio a Long Time Maker of Hand Stitched Bears. Charming Bear Fully Posable. Hand Made Long Mohair Small Teddy Bear. Made by Barb Celio a Long Time Maker of Hand Stitched Bears. Charming Bear Fully Posable. Lovely item, so happy with my purchase! Thank you very much, you were great and the delivery was on time. Vintage Wooden Rolling Pin With Green and White Painted Handles and Fabric Strap for Hanging. 1940s to 50s Baking Rolling Pin. Good Shape. Just as described. Very pleased. Arrived quickly. Thanks! Antique Victorian Boot Shoes. Fabric, Leather Look Black Boot Shoes. Tie Up Fronts. Well Worn. Antique Wooden Long John Whiskey Sign. Original Wood Piece From Long John Distilleries Ltd. Glasgow, Scotland Logo. Blended Scotch Whiskey. Victorian Lace. This inspired my quilt that was nominated "One of the Best Quilts of the Twentieth Century." I love collecting lace. Some will be shared with you! Wrote Book, Applique Lace Patterns. Available from Me. My Designs: Converse with me thru Etsy for patterns and book.